In this video, we are going to look at the angle relationships in a triangle. If we extend one side (past angle c as shown in the video) and label it , then there is another rule, which works for all exterior angles. If and , then must be . Since , then must be because they lie on a straight line. Therefore, . 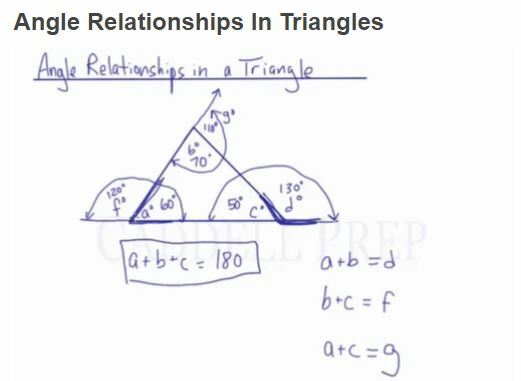 In this lesson, we’ll cover angle relationships in a triangle. A triangle has three angles. Let’s label them as , , and . If we extend the horizontal line of the triangle going to the right, we will form a new angle. Let’s call this angle . remains the same in both situations so . This is true for any of these. If you will extend the horizontal line of the triangle going to the left, let’s label this . So, if and , therefore . In this case, we proved that . Now, let’s extend the line with angle and call it angle . Since , the angle beside it is . The sum of all the interior angles is equal to . And the exterior angles is equal to the sum of the other two interior angles.